Shingles are your roof's first line of defense - but an underlayment is the second! Everyone knows that shingles protect your home from the elements, but few understand the importance of underlayments. Shingles alone cannot always stop Mother Nature from getting to the more fragile areas beneath. At Coverall Roofing, we know underlayments are a last line of defense that is crucial to a roofing system. Roofing underlayments will protect the roof deck from being compromised if water gets underneath shingles. We also know you want a roofing contractor that uses the best, so we use the highest quality products from our partners at Owens Corning. If you live in Tri County Michigan Area and are thinking about replacing your roof or installing a new one, contact us today to schedule a free cost estimate and find out if underlayments are appropriate for you in New Haven, Rochester, Farmington, Troy, Grosse Pointe, and nearby! This home had a very old roof and improper attic ventilation. With the help of Coverall Roofing, we were able to install new smart vents and replace her old underlayment and shingles with new Owens Corning Tru Def shingles. 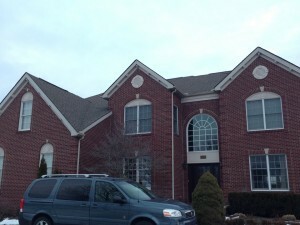 This homeowner in Richmond, Michigan couldn't be happier with their roofing project! [Company] replaced the entire roof on this home with some beautiful Owens Corning, Oakridge Aged Cedar shingles. We had some beautiful blue skies, and luckily the weather wasn't too hot for our crew. We tore off the old shingles, and put some beautiful Owens Corning Duration shingles in place of the old ones. Out with the old - in with the new! Our Michigan climate possesses plenty of challenges to your entire roofing system. From ventilation to gutters and roof itself, Mother Nature always has something new to offer. To protect roofs from wind-driven rain during the warmer months, we recommend Owens Corning's WeatherLock Self-Sealing Ice & Water Barrier Products and our Fiberglas™ Reinforced Felt Underlayment product. All are designed for both new construction and re-roofing projects. What about the fall and winter seasons? This is Michigan, so ice and snow have to be considered in any roofing project. Fortunately, Owens Corning WeatherLock Self-Sealing Ice & Water Barrier Products can still be used. These products work well on areas of the roof where water has a tendency to collect or flow, including valleys, vents, chimneys, and skylights. It's important to prevent water collection on a roof because that can cause an ice dam to form. This ridge of ice causes water to back up and sit on a roof, instead of properly draining off. This water can work its way under the roof covering and flow into the attic—and cause water damage to a home's interior. If you are like us you prefer to keep the pools outside your home! Engineered for asphalt shingles, wood shakes and quarry slate roof assemblies, the high-performance WeatherLock solution is flexible and pliable. Its poly surface and rubberized asphalt combine to adhere around irregular shapes, inside corners and sharp angles, even in cold-weather applications to 40°F. WeatherLock Mat Waterproofing Underlayment provides superior roof deck protection for your home. It helps prevent damage caused by freeze/thaw cycling, wind-driven rains, and normal water flow that occurs around valleys, vents, chimneys, and skylights. Its patented mat-faced design provides a consistent surface, reducing slipping, sticking and scuffing. It is 40% lighter than competitive products, making it easier to load, carry, and install. The Deck Defense underlayment's durable synthetic construction provides an immediate line of defense—so strong it can protect your roof for up to 6 months of UV exposure. It also acts as a secondary water-shedding barrier for your roof once shingles are installed. In addition, unlike standard felt underlayment, it comes with a 30-Year Limited Warranty. Your roof is a big investment, and it's important to make sure it's done right from the beginning. Making sure it's protected from water damage in the attic, such as mold growth and rotting deck boards, is key. One of the first steps to a high-performing roof is using underlayment in conjunction with shingles to help shield your home from moisture infiltration. Are you concerned that your roof needs work? Coverall Roofing is your premier roofing contractor in Farmington, Rochester, Troy, New Haven, Grosse Pointe, and the surrounding areas. Contact us today for your free cost estimate!